The big problem with timetables that are displayed at bus stops is that they are printed on paper. This means vandals can graffiti on them, they can fade, and they are often wrong due to unforeseen factors such as traffic jams and accidents. 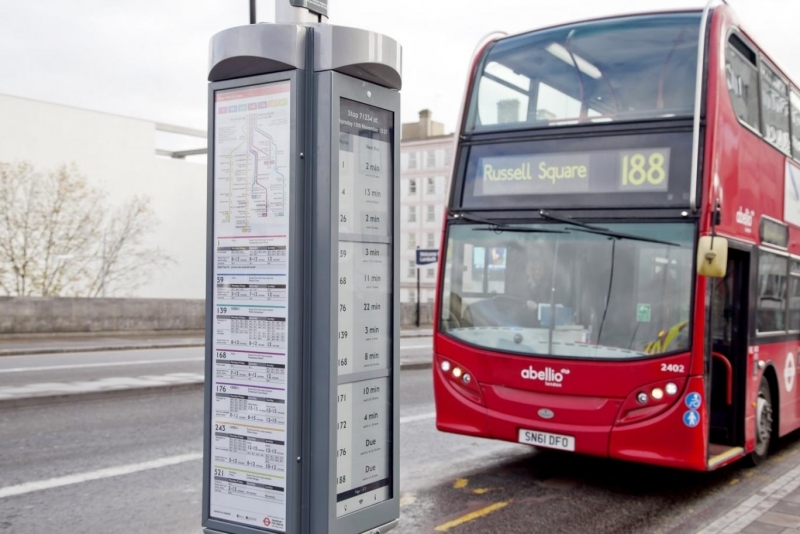 In the UK, Transport for London (TfL) - the government organization responsible for the transport operations in the area - is trying to fix this by experimenting with e-paper displays at a small number of bus stops. The e-ink in the signs is similar to that used in e-readers such as the Amazon Kindle. They are much easier to read in bright, natural light than LCD displays, and use a lot less power – which is provided by the fitted solar panels. As they are digital, one of the best elements of these displays is that they can be altered on the fly using a 3G signal. This means that any delays or changes to the schedule can be updated in real time so commuters won’t be wondering where their bus is. So far, the e-paper display is only available at one location, near Waterloo Bridge, although TfL plans to introduce three more at Parliament Square, Piccadilly Circus and Sloane Square next month. London isn’t the only area to experiment with using e-ink to display information to the public. Earlier this year, Sydney, Australia, became the first city in the world to install electronic ink traffic signs, where they are used to display real-time information to drivers during special events.